Static, aka Virgil Hawkins, is an African-American superhero created in 1993 as part of DC Comics’ Milestone Imprint. The creators of Milestone, Denys Cowan, Michael Davis, Derek T. Dingle, and the late Dwayne McDuffie sought to add some much-needed diversity to mainstream American comic books. Deliberately patterned after Peter Parker (and taking his name from a black man denied entry into the University of Florida’s law school in 1949), Static is a comic book nerd, a video game aficionado, and a gifted inventor. After exposure to an experimental chemical, Hawkins gained the ability to manipulate electromagnetic energy and took the superhero name Static. Along with Hardware, Icon, and Blood Syndicate, Static received his own series as part of the debut of the Milestone Universe. Unfortunately, for a variety of reasons, Milestone Comics was a short-lived endeavor (they closed their comic book division in 1997, though they continue on today as a licensing company). Static would go on to have his own animated series, Static Shock, which lasted four seasons on the Kids’ WB! block. He also joined the cast of the WB!’s Young Justice animated series with the second season. With the cancellation of Young Justice, and no longer having his own comic book, fans of Static were probably fearful that the character would languish in comic book limbo. But worry not. Not only will he not be limbo bound, he’ll be the title character in an all new digital series. Warner Bros. (parent company of DC Comics) has unveiled Blue Ribbon Content, a new digital production unit. Blue Ribbon Content has several live-action, short form series in development. One of those series is Static Shock. Static Shock — Writer/producer/director Reginald Hudlin (Best Picture Oscar nominee for producing Django Unchained) leads the creative team behind a live-action adaptation of Static Shock, featuring the African-American super hero Static, aka Virgil Ovid Hawkins. 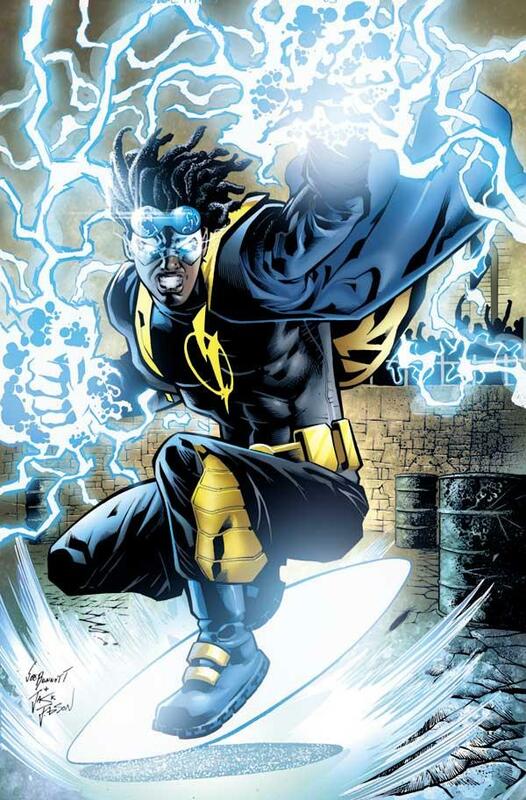 Static Shock is based on the Static comic co-created by the late Dwayne McDuffie with co-writer Robert L. Washington III and artist John Paul Leon, which was originally published by the DC Comics imprint Milestone Comics and, later, by DC Comics. Milestone Media co-founder/comic book artist/TV producer Denys Cowan (the original Static Shock animated series) is collaborating with Hudlin on the new Static Shock. No word yet on when the series will debut, nor how long it will last, but this is good news for fans. This is also good news from a diversity standpoint. Like Marvel Comics, one of the complaints about DC Comics is a lack of diversity. Traditionally, the monthly output of both companies has not seen many titles featuring African-American characters (or women, or LGBT people). Certainly both companies are making strides in gender diversity (Marvel has 10+ books led by female characters, with DC not far behind), but they still have a long way to go in representing LGBT characters and People of Color. This also holds true for both companies’ cinematic universes (although it should be noted that DC recently announced solo movies for both Wonder Woman and Cyborg, while yesterday, Marvel revealed its slate of movies for the next 5 years, which includes both a Captain Marvel and a Black Panther movie). Diversity is important for a few reasons. Despite what some angry white men might think, exposure to positive, successful media images of African-Americans tends to improve racial attitudes. What this means is that the more people are exposed to images of African-Americans that represent them as well-rounded people who can be courageous, powerful, heroic, and successful, the more people begin to reject racial stereotypes. This can be seen in the success of NBC’s The Cosby Show, which helped change the way American viewed African-Americans. Ever since television’s beginning in 1939, Blacks have often been portrayed as custodians, maids, servants, clowns, or buffoons. These negative perceptions started to appear in Black sitcoms such as Amos ‘n Andy (1964) and continued in the late 1970s with Good Times. For the most part, Black sitcoms portrayed negative views of Blacks until 1984 with the introduction of The Cosby Show. As a result of The Cosby Show, perceptions of Blacks on television were altered. Black roles of today have come a long way since Amos ‘n Andy (where Blacks were viewed as poor and living in the ghetto). Today, many Black roles avoid much of the racial stereotyping that was characteristic of shows such as Beulah and Julia in the 1960s; Sanford and Son and Good Times in the 1970s. The Cosby Show took the positive perceptions given in most of the earlier Black sitcoms and puts them into one show. Racial diversity on the small screen is also important for young children. A 2012 study published in Communications Research found that “children are affected when they don’t see themselves on tv”. Male characters are portrayed as powerful, strong, rational, and the main character, while in contrast, female characters are portrayed as emotional, sensitive, and more likely to be a sidekick or love interest. In contrast to white characters, black male characters are more likely to be depicted as menacing or unruly, and black female characters are more likely to be shown as exotic and sexually available. As a result, young white boys have greater access to positive media representation. Social identity theory would argue that exposure to this coded messaging helps young white boys believe that anything is possible, and that they can attain, achieve, and be heroes. If television serves to reinforce gender and racial stereotypes, then social identity theory also predicts that the white girls, black girls, and black boys in the study used messages from the media to evaluate themselves, and that these comparisons can impact self esteem. In addition to messages kids get from family members, peers, community members, and other areas in their lives, if white and black girls and black boys also absorb messages from the media, it could impact their self esteem if they do not see themselves as successful, as main characters, or as heroes. “Regardless of what show you’re watching, if you’re a white male, things in life are pretty good for [people who look like] you. You tend to be in positions of power, you have prestigious occupations, high education, glamorous houses, a beautiful wife, with very little portrayals of how hard you worked to get there. “If you are a girl or a woman, what you see is that women on television are not given a variety of roles. The roles that they see are pretty simplistic; they’re almost always one-dimensional and focused on the success they have because of how they look, not what they do or what they think or how they got there. We need to change the messages being sent to our youth. We need them to know that no matter their ethnicity, gender, disability, sexuality, or gender identity, they can be powerful, successful, and heroic. A show like Static can go a long way to showing our youth that the sky is the limit. ← Be Judgmental About Everything.